The unique and biodiverse ecosystems of the Dhofar Mountains are threatened by large numbers of domestic livestock, with impacts noticeable throughout the food chain. They affect vegetative, soil and hydrological ecosystem processes; most notably the ability of the region to retain water after the monsoon rains. They outcompete native medium-sized herbivores and subsequently increase the likelihood of wild carnivore attacks on livestock. This research will aim to investigate the coincidence of grazing activity with biodiversity distributions at Wadi Sayq in the Jabal Qamar mountain range of western Dhofar. Information on grazing activity will be obtained through participatory appraisal methods with local livestock owners. Existing biodiversity data sets collected by two previous research expeditions in 2012 and 2013 will be used to investigate coincidence. 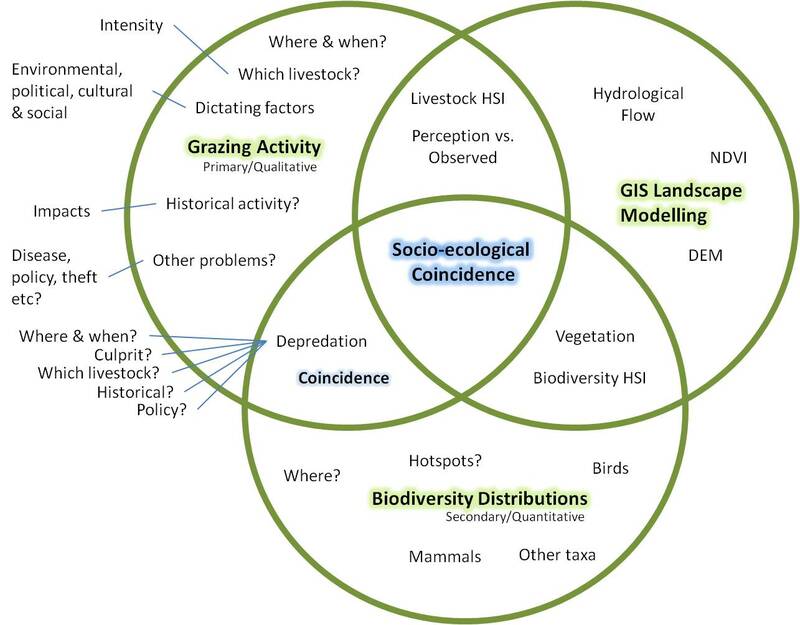 GIS techniques such as digital elevation modelling (DEM), normalised differentiated vegetation index (NDVI) and habitat suitability index (HSI) will be used during analysis and to ground-truth the qualitative data. The results of this research would be useful for conservation planning at Wadi Sayq and could provide a framework for a replicable approach across the Dhofar Mountains.